VIEQUES IS GETTING IT'S DUBSTEP FIX! Beach, Town, Country, Guetto, Puerto Rico! Insight! Surfing!Skate! Djs! B-Boys! 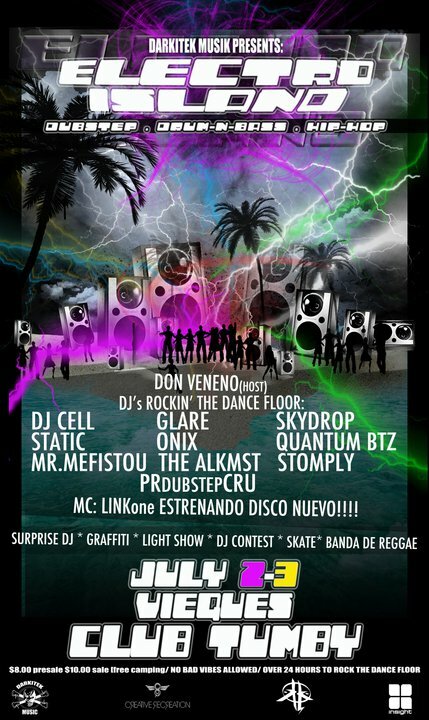 Rock & Roll!Creative Recreation!Dnb!Darkitek Music!Dnb!Dubstep!Graffiti !!Hip-Hop! *Rob Torres "Static"[ Rob Torres Music,Darkitek Music] "Sr. Tropicaleo"
*Boligoma Chemy, Mad Gab, Kid Killaz! Free camping within the event grounds with paid cover, no coolers, friendly security.